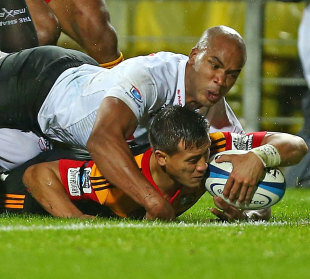 The Chiefs wrapped up the Super Rugby title with a thumping 37-6 victory over the Sharks at Waikato Stadium in Hamilton on Saturday night. Man of the Match: The Chiefs won this game not because of one big-name match-winner, but because they have forged an unrivalled team spirit - they would not be beaten. Key Moment: Sharks centre Paul Jordaan smashed his way through the Chiefs' defence midway through the first half but support was nowhere to be found and the chances of a game-changing score were gone. Hero of the Game: Chiefs centre Sonny Bill Williams gave the capacity home crowd what they wanted with a try in his last appearance for the side before heading to Japan, and they embraced him to say thank you. Villain of the Game: Chiefs tight-head prop Ben Tameifuna soured the occasion with a nasty-looking tackle on the Sharks' Ryan Kankowski, which was not punished by the officials. Credit to Kankowski for shrugging off the challenge. Talking Point: The 20,000+ miles that the Sharks have had to travel in the play-offs clearly took their toll and in such circumstances surely a seven-day turnaround is a bit unfair? Time for a fortnight break between semi-finals and the final? Play of the Game: The most dazzling piece of skill on a rain-soaked night came from Chiefs replacement Leila Masaga who swept up a loose ball on halfway before showing tremendous gas and a sublime in-and-out to ghost through the Sharks' defence to score. The hosts produced a superb display to sweep a bruised and battered Sharks outfit aside and lay claim to their first championship, with departing centre Sonny Bill Williams setting the seal on their deserved victory with the final try of the game. Winger Tim Nanai-Williams got the dominant Chiefs on their way in the first-half but they found another gear after the break with No.8 Kane Thompson, replacement Lelia Masaga and Williams taking the game away from a limited Sharks side. Fly-half Aaron Cruden pulled the strings on his way to an 18-point haul. The Sharks failed to reproduce the heroics that helped them account for Australian conference champions the Reds and their South African counterparts the Stormers earlier in the play-offs, and two penalties from Frederic Michalak were never going to be enough to secure their first crown. Instead, they must reflect on what is their fourth defeat in a Super Rugby title-decider. The Sharks began strongly and held their own in the opening exchanges but got little reward from a resolute Chiefs defence. Michalak opened the scores from the kicking tee but the home side soon found their feet in front of a vociferous capacity crowd. Rain made the playing conditions difficult but the Chiefs finally hit their stride midway through the opening period. A clever chip from Cruden sparked what would prove to be a crucial move, with centres Andrew Horrell and Williams driving the Sharks back before the ball was worked wide to Nanai-Williams who squeezed over for a try. Cruden followed up the excellent conversion with two penalties to edge his side into a 13-3 lead at the break as the Sharks' epic play-off travel schedule began to catch with them. Desperate to erase the memory of their mauling at the hands of the Bulls in the 2009 Super 14 Final, the Chiefs raised their game after the break and soon forced a five-metre scrum, from which Thompson powered over for his first try of the season. A dangerous tackle from Chiefs tight-head prop Ben Tameifuna on Sharks No.8 Ryan Kankowski then threatened to undermine much of his side's good work but the challenge went unpunished by referee Steve Walsh. Michalak's second penalty offered a glimmer of hope to the Sharks but the result was all but confirmed when Masaga pounced on a loose ball before showing a great turn of speed on his way to the Chiefs' third try. A crowd-pleasing desire to keep the scoreboard ticking over resulted in a perfect send-off for Williams, who will now move to Japan before returning to rugby league next year. A strong run from the All Blacks international had the Sharks scampering in defence and while they thwarted his initial attempt to cross their line, they could do nothing to prevent him dotting down a couple of phases later. Cruden's conversion capped a fine game for the Chiefs' playmaker and sparked celebrations throughout the country as New Zealand claimed the Super Rugby honours for the first time in four years.